Ride the forest roads of Central Washington with other Super Ten owners, and the odd BMW or two. Sponsored by Sportland Yamaha, Cyclops Adventure Sports, Seattle’s own AltRider, Konflict Motorsports & Suspension, and Heidenau Tires. Good times, great swag! AUGUST 15th: Meet at Jeff Anderson’s home in South Cle Elum, WA at 7pm for a dinner meet-and-greet. Chet Mainwaring, off-road instructor, will give us off-road riding tips as well as pointers on bike setup. Email Please email Glen at glencomeaux@me.com for directions to Jeff’s house. Menu: Salmon, cole slaw, pasta salad, corn on the cob, rolls and cookies. AUGUST 16th: Meet at 8am at Sportland Yamaha in Cle Elum, WA for a pre-ride meeting and delicious continental breakfast of coffee, juice, and baked goods from the Cle Elum Bakery. Group up for day rides (various terrain/skill levels offered). Depart at 9am. Pack a lunch! Return to Cle Elum for group dinner at 7:30pm at Smokey’s Bar-B-Que in the old Train Depot. Ride debrief, socializing, and some swag, merch and prizes from our sponsors. Get a good night’s sleep and do it again. AUGUST 17th: Meet again at Sportland Yamaha at 8am for breakfast and pre-ride meeting; choose a different route this time! Friday Dinner and Presentation: $20 per person. This covers Chet’s presentation and your dinner of salmon, cole slaw, pasta salad, corn on the cob, rolls and cookies. Sat/Sun Breakfast: $5 each morning per person. Covers coffee, juice, baked goods from the Cle Elum Bakery, and a few other assorted goodies. Saturday group dinner at Smokey’s Bar-B-Que in the old Train Depot. Separate checks. These routes consist of off-road back-country riding. These are UNSUPPORTED rides with no trailers or sweep riders to cover you. For safety, please observe common-sense riding behaviors. Over dinner Friday night and during breakfast each morning, we will discuss the routes. Please feel free to group up and pick your own routes. We have seven routes to choose from, so please break it up and don’t all pick the same route. A traffic jam of 40-50 bikes in the back country isn’t much fun. If groups want to ride the same route, space group departures by at least 15 minutes. Urgent care is available at the Cle Elum Urgent Care Center, 201 Alpha Way, Cle Elum, WA 98922. Phone: 509.674.6944. As you can see, all the loops overlap, which means you can mix and match to design your own route. Just be back for BBQ dinner Saturday night at 7:30pm – there will be great food, and prizes from our sponsors! 45-50 miles of dirt roads await you over mountain passes and deep valleys. From deep forest to sage brush desert, you get it all! The majority of the loop is on graded forest roads with a few steep parts. Off-road tires (at least 50-50) are recommended, as FR 7036 and 7037 heading up to Pyramid Pass include extended rocky, uphill sections. Naches Pass is also a little rocky. Due to a couple of washouts, Section 3 has been re-routed over old Blewett Pass on the way to Leavenworth. Leavenworth would make a great lunch stop before heading back to try other loops. This route involves highway and graded forest roads, so the stock tires are okay. However, there is a 1.7 mile rocky part that will be slow going for a newer rider who doesn’t have off-road experience, as well as a short but steep downhill section on Mountain Home Road above Leavenworth. Head down to Ellensburg on Highway 10 along the river before turning onto Umptanum Road, which quickly changes from river scenery to rolling desert hills. About 10 miles of graded gravel (w/a little washboard) await you before turning back to nice pavement not far from Wenas Lake. Selah is just a few more miles. The River Ridge Golf Club is supposed to have good grub, so check them out. On the way back get on highway 821 (Canyon Road) for one of the best roads in the state. You will love it! Pavement lovers, this one is for you! 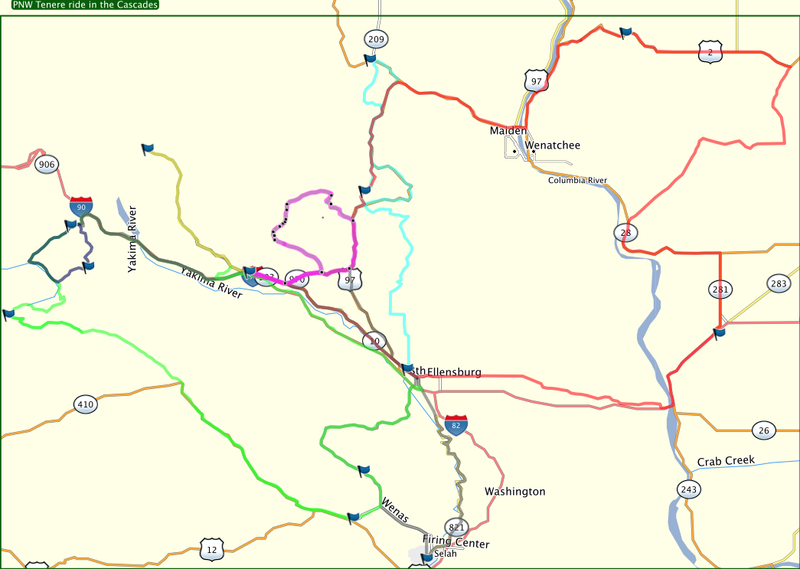 Here is an all-day 230-mile loop thru some of the most scenic parts of the state. The forest, high plains, and deep gorges make this route a geologist’s dream. There is a two-to-three mile section of easy graded gravel on Palisades Road / Devils Grade/ 24 Road NW. It’s an easy gravel experience, so don’t let it scare you off – the stark scenery is worth it. If you don’t want to venture into the dirt, just continue south on Moses Coulee Road and Sagebrush Flats Road to Ephrata. Old Blewett pass is also an option. There may be heavy traffic between Quincy and George, as there is a show at the Gorge (Tom Petty, Steve Miller Band, and Aerosmith). Also it will be HOT, so be prepared with appropriate gear and plenty of water. This is a nice 1.5-hour loop to some great views at the top. It’s beautiful pavement and a great dirt section for the beginner who wants to experience riding off road. If you haven’t mastered the “downhill” in the dirt, it would be best to do this loop clockwise. Start in the Teanaway Valley and come out just south of Blewett Pass. This is the easiest of the routes, and affords time to eat, float, and appreciate your surroundings if you so choose. Bring your rubber ducky (or your floatie!) and take a nice ride through the historic town of Roslyn, past Cle Elum Lake and through Salmon La Sac to high-mountain Cooper Lake. Float or swim for a bit then head back south. Recommended lodgings in and around Cle Elum. Eagle Valley Campground – This is where several of our riders have already made reservations. Join us! MORE INFORMATION can be found on our FB event page. August 25, 2014 in Ride Plans.